Since CEY is hosting a Wadena KAL for the month of September, all the WIP Wednesdays this month will be progress on some of the Wadena shawls that are being made here at Classic Elite Yarns. Each of us is doing something a little different (different yarns, different gauges, different color combos) and I think it will be fun to see how everyone’s shawl is progressing. I thought I would start the ball rolling with my Wadena. I really like working with smaller needles, in fact the smaller the better. I know that many of you are cringing right now, but it’s true. To me the thought of making a shawl on a size 8 sends shivers up my spine…and not in a good way. 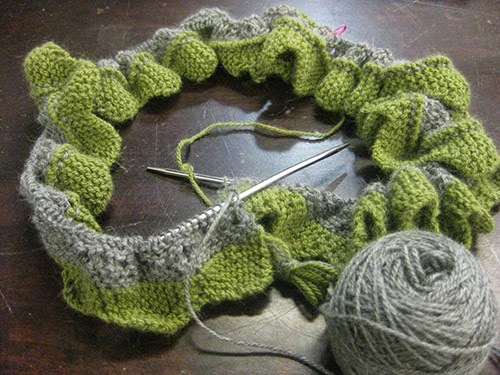 I thought about what yarn I wanted to substitute for the Majestic Tweed, and I keep coming back to Fresco. I had yet to make anything out of it and there are so many yummy colors. Plus I could use a smaller needle. I picked Icy Teal as my main color. This is one of my favorite colors, but somehow I don’t own a shawl or scarf in this color. I knew I wanted a very subtle palette for my Wadena, and chose the Gray Stone for the garter lace section. After some discussion at the lunch table, I decided to do the edging in Pea Pod. I really love how the colors go together. Monday, day one of the KAL, was a holiday here in the United States. So I was able to get going right away on my shawl (after sleeping in of course). I found that the edging worked up really quickly. Each ‘bump’ (as we are calling them around the office) only took me about 4-5 minutes. Before I knew it I was picking up the stitches for the garter lace section. It won’t be long now until I am moving on to the Icy Teal (yay!). This shawl is going so quickly that I might actually be able to make more than one for the KAL! Are you knitting along with us? Join our thread on Ravelry to discuss your progress and make sure to following our Wadena KAL board on Pinterest to see everyone’s shawl.